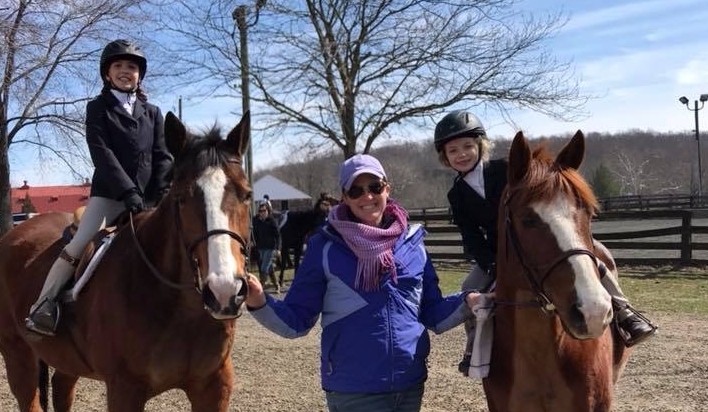 Here’s me with two of our young riders at a local show last weekend. Last week, I taught a new student. Let’s call her Joan. Joan is a Short-Stirrup rider. She can walk, trot and canter, and jump small jumps. She knows how to groom and mount. She knows to keep her heels down and how to properly pick up and shorten her reins. When I teach riders like Joan for the first time, I spend the first few minutes of mounted time going over basics. There’s the plumb line from hip to heel, and the straight line from the bit to the elbow. We discuss the reasons for putting our heels down; it goes beyond not losing the stirrup, but also lowers our center of gravity. I have a great analogy to describe what that concept is, so even my youngest riders can understand. We also talk about placement of the stirrup on the foot, which should be on the ball, angled across the foot so the outside branch is touching the pinky toe. The stirrup is perpendicular to the horse, while the foot is about 30 degrees out from the horse’s side. If I stand to the side of the rider, I should see a tiny bit of the rider’s boot sole. This is the modern style, one that lends itself to greater flexibility through the ankle, and since we are a show barn, we teach the proper look for showing in equitation classes. If you’ve spent time watching today’s top equitation riders, you will notice this way of doing it. During this initial discussion and assessment, we got to two-point, or jumping position. This is when I saw the most fascinating thing. Joan had been taught to NOT touch the horse’s neck when practicing two-point (and when jumping). Her previous instructor had gone out of her way to tell her that it’s not allowed. As a result, Joan had difficulty maintaining the correct position. 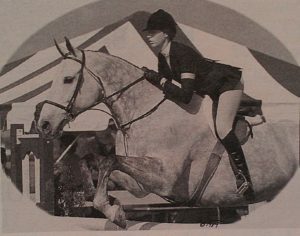 She regularly lost her balance, and developed a “roached” back from not having correct angles (hip over saddle, hands forward, weight in the heels). All she needed to do was press her hands on her horse’s neck to gain the stability she needed. I sensed relief from Joan, that the struggles she had weren’t going to hold her back anymore. I guess I should have been happy, to instantly teach something so simple and necessary to turn a typical riding activity that had been difficult into something much more straightforward, but I was mad. I cannot understand how some trainers could think that a beginner rider’s legs will be strong enough to hold them in place over every jump, at every distance. At first, the thrust of the horse can come as a surprise. Then what happens? The rider falls back into the saddle early, hitting the horse in the back and the mouth, the cardinal sins of riding. I care about my school horses too much to let that happen, when I can teach something that helps prevent that: grab mane, push on the neck. It’s a correct crest release. 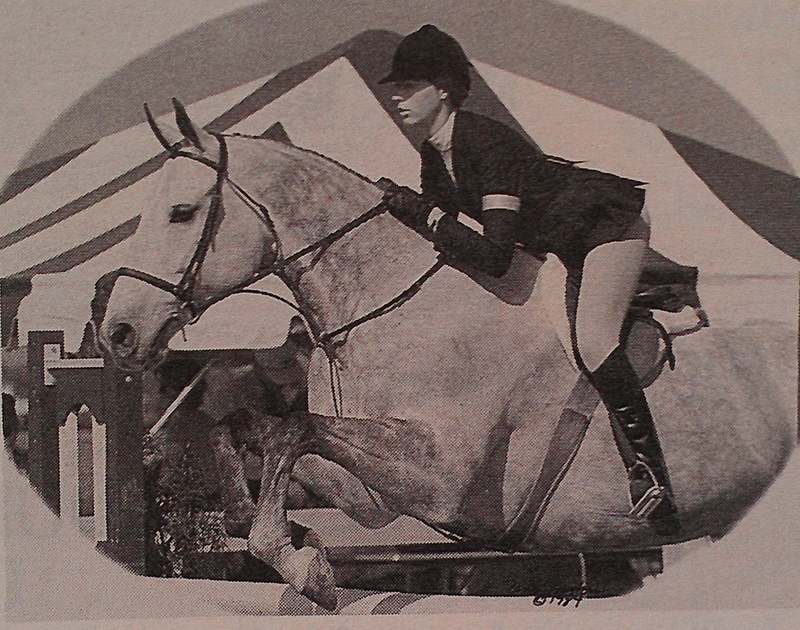 A position to die for: Francesca Mazzella won the ASPCA Maclay and the AHSA Medal Finals in the same year. 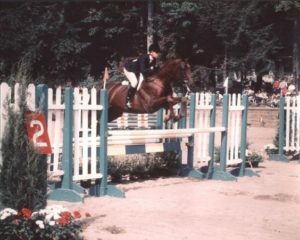 She was my childhood idol, and the reason I wanted to focus on Equitation. Years ago, George Morris promoted the crest release as a way for riders who were learning to jump to stabilize their position in the air. The hands push alongside the crest of the horse’s neck, which gives the rider greater security. The rider is also able to grab mane to get additional security over the jump. I like to teach grabbing mane as a way to use your upper body to train your lower body. For many riders, they need to feel the correct position in order to replicate it. With the horse’s thrust, the rider hasn’t yet developed enough strength to hold the two point position in the air. Yes, you can practice jumping position on the flat, and that will build a certain amount of strength, but there’s nothing that can duplicate the actual thrust of the horse over a jump. When the rider grabs mane, she can use some strength in her arms to hold tight and help her lower body stay in the correct place over the jump. By doing so, her brain has a chance to build neural pathways so she can do that without holding mane, or pushing on the neck, but that develops over time. The horse gets hit in the mouth and the back. The rider never feels the correct position because she is jostled loose in the air…every time. The horse can’t possibly tolerate that for an extended amount of time, so he forges on in pain and discomfort until he decides that NOT jumping feels better than jumping. Francesca Mazzella in the USET Talent Search Final, having switched horses. A beautiful crest release. I believe that trainers are telling their students to not touch the neck to get stronger, which I firmly believe has a place on the flat, but not over fences until the rider is more advanced. They may also be telling their students that because they learned it that way themselves. The “Automatic Release” (following hand, lowered alongside but not touching the neck) was the initial way riders learned to jump before the crest release. There’s an easier and safer way now, and the crest release has been taught for the last 40 years! A rider once came to me with lovely heels and the correct angles…from the side. But if you looked at her from the front, you could see her thigh and knee didn’t make contact with the saddle. At all. She rode completely on her calf. To boot, her toe was completely straight forward (parallel to the horse’s side). Try riding like that. I can assure you that level of contortion is tough to accomplish. Another time, I had an adult rider come to me who had taken two years of lessons and didn’t know how to steer. TWO YEARS. Why? Because her lessons consisted of a horse in side reins (!) who just went around the edge of the ring, following the other horses. TWO YEARS. What trainer thinks that two years of trotting nose-to-tail is an education? Why do I care so much about these gaps in riders’ education? For one, I have to fix the things they teach, so that slows things down. Two, it annoys me that unknowing consumers are taken in and taken advantage of. Three, I can’t believe that some of these “trainers” are actually compared to and with the trainers like me in the area that teach quality lessons and horsemanship. Four – and most importantly – the horse pays a price for this lack of education. Folks, there is a reason we need good equitation, and it’s not about looking pretty on a horse. Form follows function. Every piece of the riding position that is taught is that way for a reason! A proper equitation position should never be about posing, but rather, it is safe and effective. When you learn the correct position, being effective becomes so much easier. Our riding forefathers created the modern equitation position to make it easier to jump, stay on, turn, and get the horse to do what we ask. It’s safer and it serves a purpose! Examine photos and videos of the best riders. Watch videos of the top riders like Madison Goetzmann, Lillie Keenan, Hunter Holloway, or Makayla Langmeier. That’s just the Equitation riders. There are great videos of great jumper riders, such as McLain Ward, Beezie Madden and Kent Farrington, too. Read George Morris’ critiques of jumping form in his column in Practical Horseman Magazine. Go to horse shows and watch who is winning. Watch all of a class, so you can learn to see differences between riders and horses. If you read the above mentioned book on Judging, you’ll have a better idea of how the judge makes decisions and you can see the differences better, too. Read the US Equestrian Federation rule book. The Equitation section has specifics on the position judges seek and reward. *Note: Please beware of YouTube videos in general. In writing this blog, I had hoped to find a video to post that shows something as simple as how to correctly hold of English (non-double) reins, and I couldn’t easily find anything. I may have to make a video myself! **Additional Note: As you avail yourself of these additional learning opportunities, please ask questions! I have had students who were excellent at mimicking other riders. Unfortunately, they would mimic the bad riders, too (hello, posting at the canter?! ), so it’s important to tease out what is good and bad about different riders’ styles, so you can acquire the right skills and position. If you want good qualify instruction on video, check out EquestrianCoach.com (with Bernie Traurig), or AnneKursinski.com, they are hosted by two of our show jumping greats. There are also educational videos created by the United States Equestrian Federation, at USEF.org. All are paid sites (for USEF videos, you need to be a member). Good luck. Knowledge is power. Do it for yourself, your wallet, and your horse. Very good blog article! You have reminded me to make sure I know why certain things are needed, rather than to just follow them as instructed. I have great instructors who are glad to answer questions so they won’t be offended by them. It is also interesting to see inside your head about a new student. Thank you for this blog post!